Thirty-something midwesterner Mark Fife believes he has successfully moved past the accidental death of his young son Brendan, as well as his subsequent divorce from his college sweetheart Chloe. He's successful, he's in love again, and he believes he's mastered his own memories. But then he is contacted by a strange woman who tells him not only that she owns his old house, but that she believes it to be haunted by Brendan's ghost. Will Mark--who does not believe in ghosts--come to accept the mounting evidence that Brendan's is real? Will his engagement to his new love Allison be threatened by the reappearance in Mark's life of Chloe--who does believe? If the ghost is real, what can these two wounded parents do to help their son? 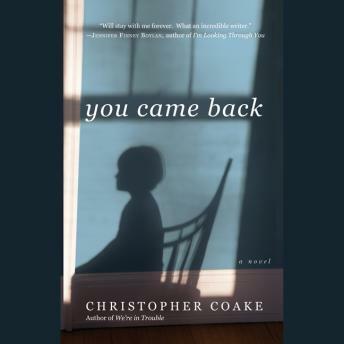 YOU CAME BACK examines the beauty and danger of belief in all its forms--not only belief in the supernatural, but in the love that binds parents and children, husbands and wives.